Shaped let’s you run a route of a specific shape with runners globally. Shaped let’s you run a route of a specific shape with runners all around the world. You tell the app how long or how far you plan to run and it will suggest shapes to you. You select a shape and the app will calculate the best route through the streets near your location based on your location, preferences and previous workouts. Once you start running it will navigate you through those streets, forming (part of) a shape on the map. 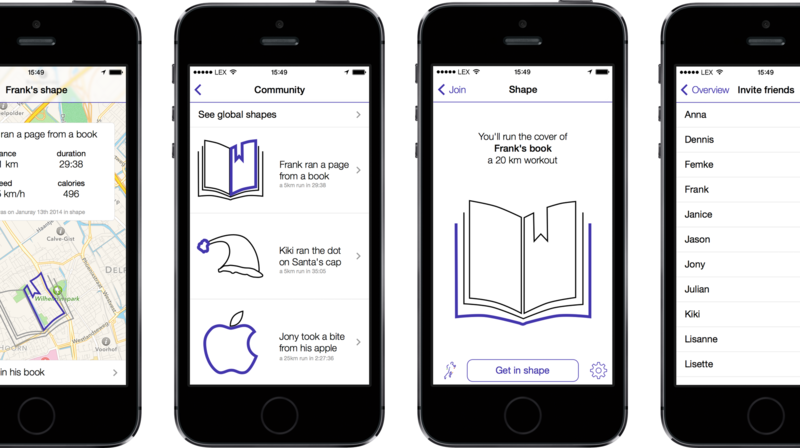 You can collaborate on a shape with your friends, people in your local area or even globally. You can see what shapes your friends ran and join them. Or you could invite them to the shapes you’re running. The routes do not have to be connected, they will be combined in the app. This way, you might run the left ear of a bunny shape, while someone in New York can run the teeth of that bunny and the right cheek is run in London. Or you can run one page each day and the app combines those pages to a book once you’re done. Concept video of Shaped as shown at the final presentation. Shot and edited in one night. My goal in this project was to savor a good run. My string of thought was such that, when you have more fun and work on something together, you have more to look back at afterwards. And not only more, but also a better memory of it. There’s a Dutch tradition where on several evenings, prior to Sinterklaas pakjesavond, children place their shoes near the fireplace. 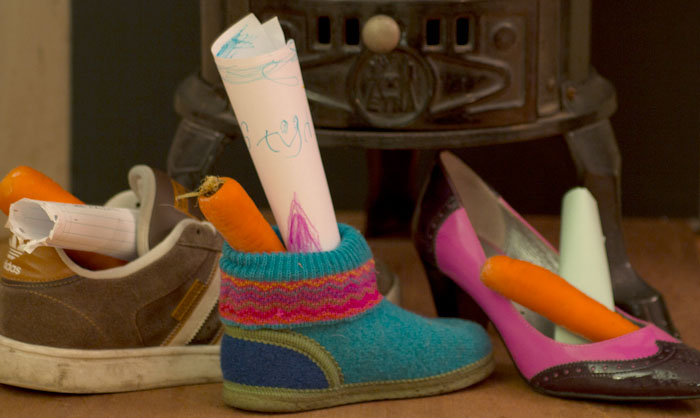 They fill the shoe with drawings, wish lists and a little something for Sinterklaas’ horse (which explains the carrots). After singing Sinterklaas songs they go to bed. The next morning the drawings and carrots are replaced with kruidnoten, sometimes poems and of course a present. This interaction contains many great qualities, like preparation, anticipation, stimulation and fun. It’s a social event where children and parents sit and sing together, yet also personal where every family has their own way of doing things. The presents the children get the next morning are rewards for singing the night before and for being sweet kids. I used this ritual as a metaphor for the interaction with Shaped. It is fun, social, stimulating and rewarding. Using Shaped and running those shaped routes really is a lot of fun. The community side of Shaped is obviously social, where joining and inviting your friends to shapes really stimulates a runner. And looking back at the route you ran and seeing it as part of a bigger picture (shape) makes you feel good and is a reward by itself. The Shaped concept app same a couple of unique features and integrations that deserve highlighting. The community is a major part of Shaped. Tapping the globe from anywhere in the app brings you right to it. On the main community page you’ll find a list of what your friends have shaped, along with a short summary, their route highlighted on a shape and a fun personal sentence each. Instead of saying “Frank ran 15 km in 1:55”, it says “Frank ran a page from a book”, which makes it really fun and enjoyable to scroll through the list. A friend’s overview, the community page, and joining/inviting friends’ shapes. Tapping a friend’s item will show an overview of that run including the shape on a map and the total shape. You can even join your friend’s shape here. At the top is a “Global shapes” button, which brings up a big map with all the shapes worldwide. Tapping one allows you to see more details and even join it. The shapes in the app are great opportunities for companies to join the community as well. Companies like Coca Cola, Nike or McDonald’s could introduce their own shapes for the community to run. For example the Red Cross could present a cancer awareness ribbon that all users around the globe could run on the same day. This would really send an amazing message. 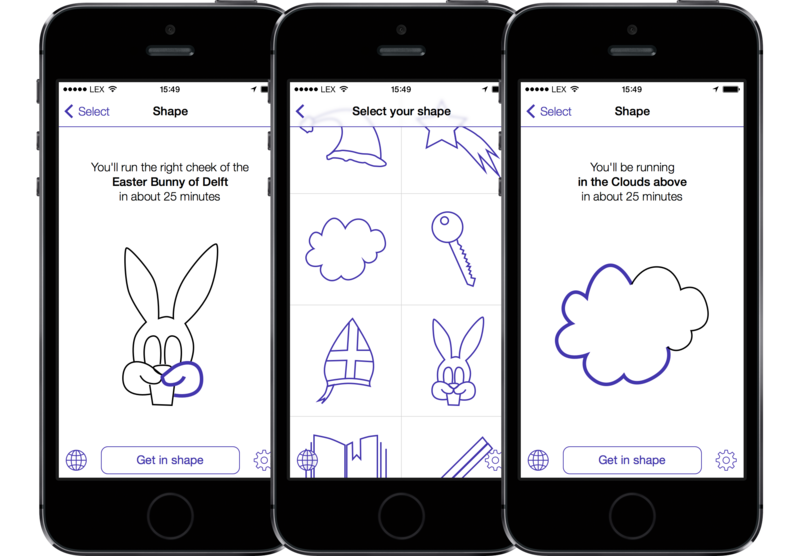 During holiday season, the app could suggest themed shapes like a bunny for Easter, Santa’s hat with Christmas or Sinterklaas’ meiter in December 5th. Shaped is tightly integrated with RunKeeper and the Health Graph API to sync all your workouts and friends, and get insight into your previous workouts and performances. If a runner selects a duration (time) to run, instead of a distance, the app will analyse his previous runs to get a distance he might be running in that timeframe. This historical data is an example of the integration with RunKeeper and the Health Graph API. Syncs friends and workouts with RunKeeper. Uses historical health and workout data through Health Graph API to make shapes. Navigation and route planning are powered by TomTom. Routes are calculated based on the user’s location using GPS, the selected (or calculated) distance and of course the selected shape. Calculations are done using TomTom’s routing API by cross referencing intermediate points of the shape with the map and planning routes between those. It will also give runners visual and voice directions so they can concentrate on their workout. After the workout is finished or stopped, the runner is presented with an overview of the run with some statistics of his/her workout and of course the travelled route and how good he/she contributed to the total shaped, which is quite rewarding. From this overview, the user can invite friends to contribute to the shape. Design a product for savoring, that what the assignment wrote. People seem fairly good at seeking short moments of positive delight, however rather poor at enjoying joy in a lasting way. The initial pleasure, pride, or affection once experienced eventually fades because people adapt to a positive change and consequently take it for granted. This is detrimental for maintaining an increased level of happiness and calls for a new way of thinking and interacting in our environment: paying attention to and appreciating a positive experience (i.e. savoring) can slow down the process of adaptation and thereby maximize and prolong a happiness benefit. In the exploration phase I conducted an online survey among runners. I learned that most runners run in the evening and about 3 times a week. My main insight was that running has a barrier of entry, but is fun afterwards. This occurs both on running as a whole as well as with each individual run. Also, about 37% of the runners do some form of preparation, and all of those see a positive effect on their performance. I also gained some ideas on how to motivate and prepare people and how to create anticipation thanks to a brainstorm session with interested students. I found that greeting runners gives them a real boost and that sleeping in running gear removes a barrier to run in the morning (I tried). I also had a prototyping workshop, which gave me insights in how sending reminders, tasks and rewards to runners before a workout influenced their behavior. Shaped is designed specifically for iOS 7 and the iPhone 5. It uses the clean and simple design elements from iOS 7 like thin hairlines and white spaces, but also the advanced hierarchies and blur effects. For my final presentation and prototyping the app, I made vector images of all the possible screens. I connected them together in Flinto to make a testable and presentable prototype. 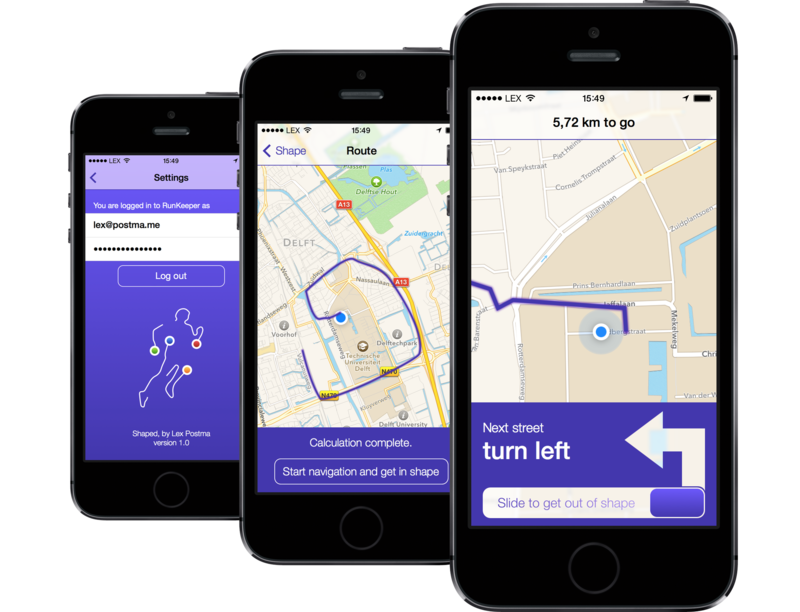 App for RunKeeper, Delft Institute of Positive Design, and TU Delft from 2014. Individual project focusing on conceptualising, designing and video editing. Assignment: How can design support savoring in our personal lives? There are multiple possibilities to focus on in the design solution: for instance, savoring can span from attending to positive feelings in the present, to reminiscing about the past and anticipating the future. Furthermore, the target of savoring can be an event, circumstance, other person, object, or a human-product interaction as such. Shaped was used as a design example in the paper Enjoying Joy. A Process-Based Approach to Design for Prolonged Pleasure. by Dr.-Ing. Anna E. Pohlmeyer (2014). Shaped was exhibited at the 7th European Conference on Positive Psychology in Amsterdam, the Netherlands (2014). Want to know more about Shaped? Don’t hesitate to email me.